This semester in Professor Lisa Mazzie’s Advanced Legal Writing: Writing for Law Practice seminar, students are required to write one blog post on a law- or law school-related topic of their choice. Writing blog posts as a lawyer is a great way to practice writing skills, and to do so in a way that allows the writer a little more freedom to showcase his or her own voice, and—eventually for these students—a great way to maintain visibility as a legal professional. Here is one of those blog posts, this one written by 3L Corey Westfall. If the 2017 American Bar Association (“ABA”) annual conference provided an entire session focused solely on fashion, fashion must be a real legal issue! ABA paid for a Brooks Brothers session that provided modeling, lectures, and a pamphlet. 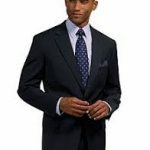 And while Brooks Brothers used that session to advertise their “relatively affordable pieces” (do not be duped; there are more affordable options), Brooks Brothers also provided some useful tips: (1) stick to dark grey and dark blue suits/skirts; and (2) limit shirts to solid blue and solid white, and lightly patterned versions of blue and white. (Number (2) for women may have some slight variations in color, but not much.) Conservative tips, but safe nonetheless. We law students are joining a profession older than we are, with fashion norms out-aging our already-outdated law school wardrobe! So, conservative air should waft out from a fresh-faced associate’s wardrobe. And Ross is correct. Because humans use first impressions to base future decisions, outward appearance certainly shapes those impressions, both socially and professionally. Meanwhile, lawyers rely on outward appearance to win over a jury, advertise the profession, and attract clientele. Thus, in an industry where first impressions matter, a lawyer must look like a lawyer at both the office and the local fruit stand. (DISCLAIMER: I do not advise wearing a suit to exercise. Active wear is still recommended for physical activity but should be limited to exercise. My mom is probably giggling, knowing that I am too generous with my active wear). And so, to answer your question, roommate, an associate-lawyer’s wardrobe should include white and blue shirts, dark grey and dark blue suits/skirts, and brown and black shoes. That’s it. The above sources suggest that there are enough details in formal-wear (collars, ties, cuffs, shoes, jewelry) to jazz-up the outfit. But do not feel the need to jazz-up. As Attorney Ross posits, the more experienced attorneys earn more leeway in fashion, so an associate should not attempt to out-dress the partner at a deposition. Good news in all of this: it is easier to pick what to wear in the morning! Bad news: lawyerly clothes cost money. So, let us hope that lawyerly salaries provide for fashion expenses. Or better yet, maybe lawyers can claim work-clothes as capital assets on their tax returns!? Please know that I want your comments and concerns, and even personal feedback. How should I improve my wardrobe? (I know it can be done). Next up: What Does a Lawyer Smell Like? I always have struggled with finding the balance between dressing to impress and not overdressing the partners. Personally I like some of the vintage patterns like herringbone and houndstooth. The thrift stores seem to have an abundance of them. Sometimes I didn’t wish the fashion industry didn’t evolve. 3 piece suits are becoming of thing of the past–even suspenders. From my experience, it is true that experienced attorney have earned the ability to dress with more leeway. Indeed, one of my mentors sometimes has client contact while he wears his Birkenstock sandals! And, nevertheless his practice is not struggling by any means. Though some people term him as an odd”, he has practiced criminal law for approximately 40 years and the judges and other criminal defense attorneys in Milwaukee and Waukesha counties know him as a very intellectual person. Some attorney just won’t hang it up. (Well, they will hang up their suit). I also liked the point you made about the expense of the modern suit, tie and even dress shoes. Lawyers are judged by their appearance. Lawyers gossip just as judges do. I do think that we should always have something tailored and that fits, but I don’t think that we should jump to buying an expensive wardrobe just to please the judge, partners, associates or the profession, unless of course what you said, the salary accommodates. You might want to consider looking at the recently published book: “The Laws of Style: Sartorial Excellence for the Professional Gentleman”, published by Ankerwycke, an ABA publishing branch. (You can find this book in the Law Library at TT618 .H36 2018). Granted, the book is written for men’s style, and one would hope that ABA would produce a comparable book for women, but it is, nonetheless, an entertaining and informative read. During the OCI program this fall it was really difficult to find a high-quality women’s suit, because most department stores only sell “suit separates,” if they even sold women’s business wear at all. When discussing the upcoming OCI program during my summer job, a female lawyer at my place of employment suggested I look on corporette.com. I highly recommend corporette.com to any female law students and lawyers who are looking for suggestions for wardrobe essentials and trendy pieces that are work-appropriate.